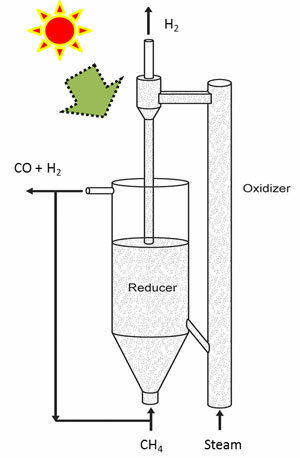 (Nanowerk News) A team of chemical engineering researchers has developed a technique that uses a new catalyst to convert methane and water into hydrogen and a fuel feedstock called syngas with the assistance of solar power. The catalytic material is more than three times more efficient at converting water into hydrogen gas than previous thermal water-splitting methods. The work is described in two papers that were published in the Royal Society of Chemistry journal Energy & Environmental Science. “Perovskite promoted iron oxide for hybrid water-splitting and syngas generation with exceptional conversion” was published online Dec. 10, with He as lead author and his advisor, Fanxing Li, as senior author. He and Li were also lead and senior author on “A hybrid solar-redox scheme for liquid fuel and hydrogen coproduction”, which was published online in April. The April paper was also co-authored by Gregory Parsons of NC State, James Trainham of RTI, and John Newman of RTI and UC Berkeley.